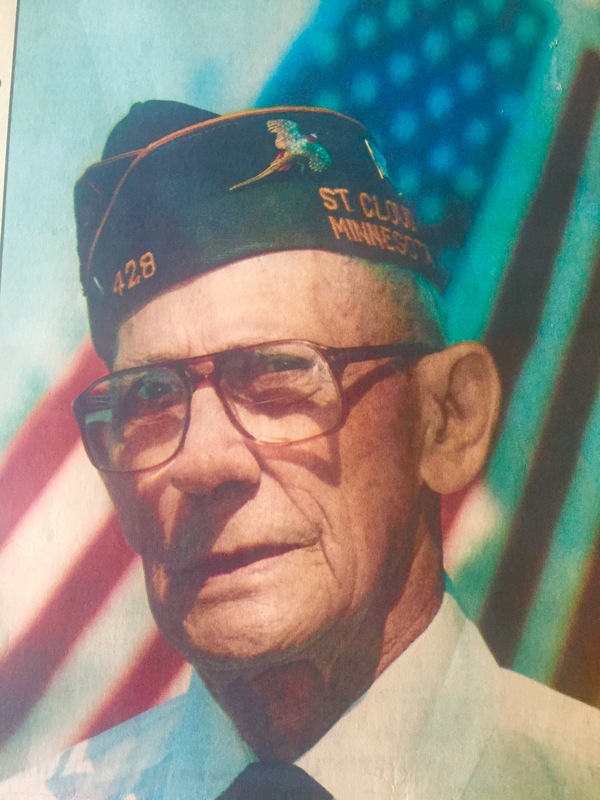 Clarence “Cobby” Saatzer, Paul’s grandfather, led a platoon of fifty men onto Utah Beach on D-Day, June 6, 1944. He lost fifteen of those men the first day. From his first battle at Utah Beach, Cobby went on to fight many other WWII battles and was awarded three Purple Hearts, a Bronze and a Silver Star. 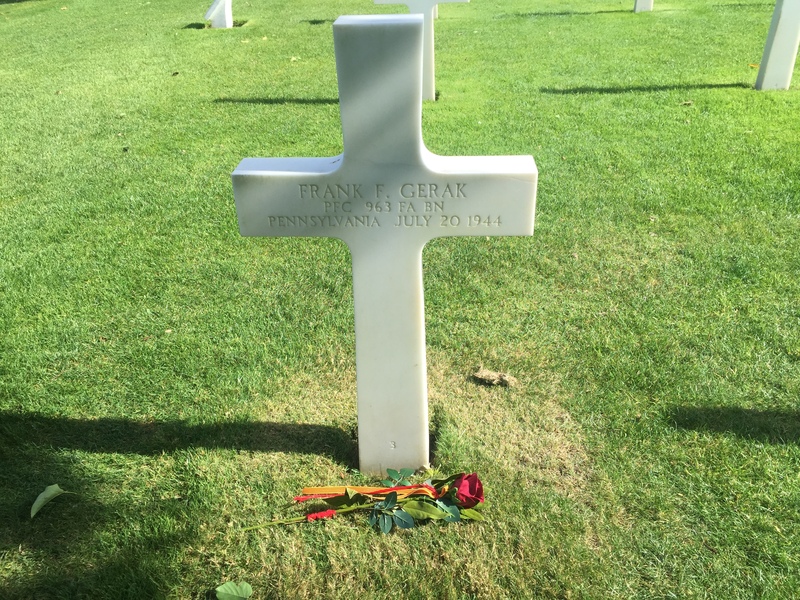 He was recommended for the Medal of Honor during the Battle of the Bulge. 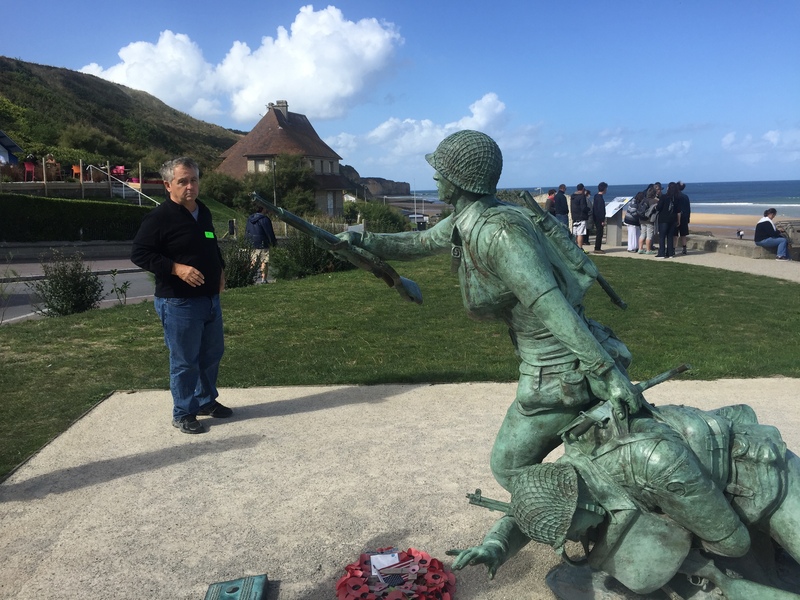 As we traveled to Normandy to visit some of the D-Day sites, we remembered his stories about that day and thought about the sacrifices made by Cobby, both our fathers and so many others. 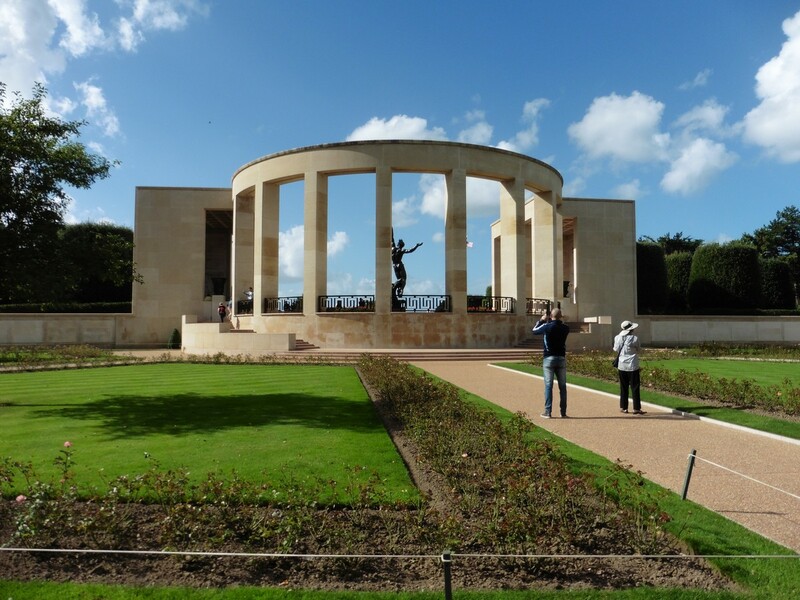 Three-fourths of the city of Caen was destroyed in the summer of 1944, so museum founder Jean-Marie Girault felt it was a fitting location for the museum, which focuses on WWII, D-Day Landings and the Battle of Normandy, and the Cold War. The museum covers these events with the goal of keeping these memories alive to save us from “man’s inhumanity to man”. I highly recommend visiting this museum for anyone interested in WWII and D-Day. 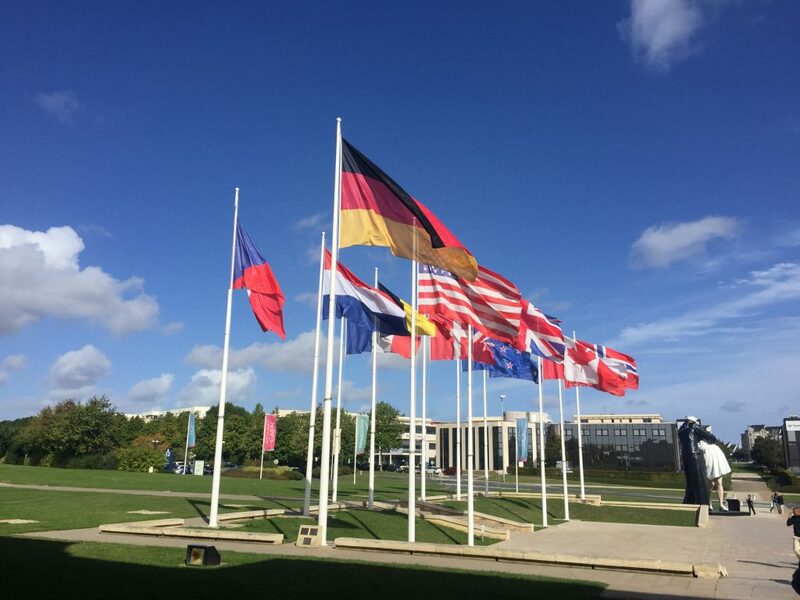 Large flags from the countries involved fly outside the entrance of the museum. Our visit started with a moving film about the D-Day Invasion. Using mostly actual footage, the twenty-minute film powerfully conveyed the horrors of that day. 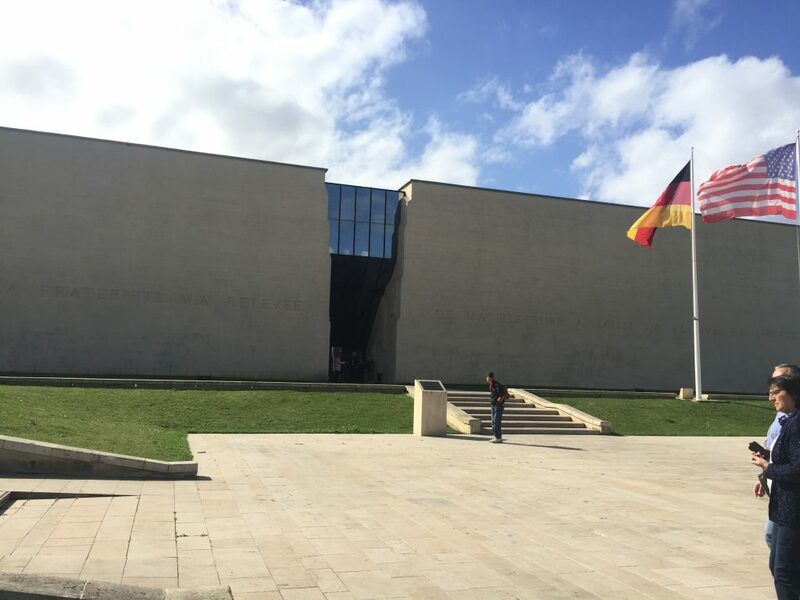 The museum did an excellent job presenting complex historical information, and I left having a much greater understanding of what happened during WWII and why. 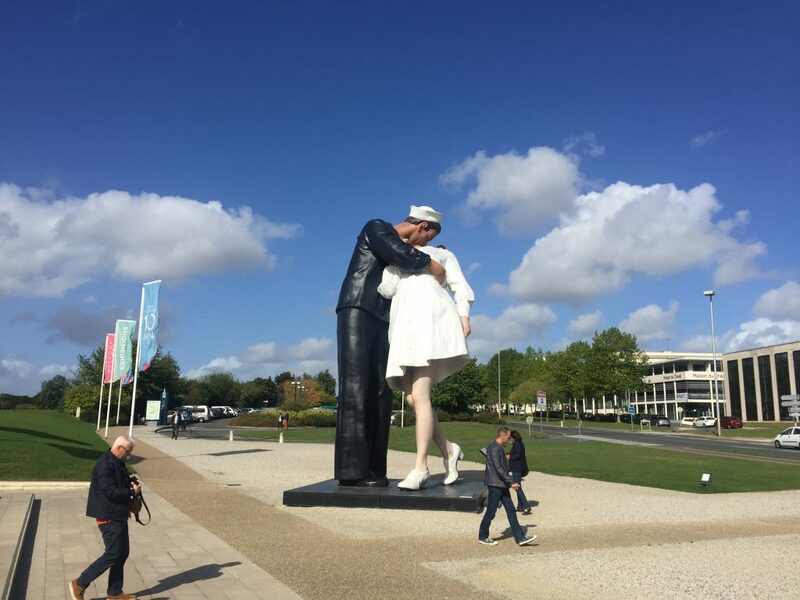 Since the original copy of “Unconditional Surrender” was first installed in Sarasota, FL. where I live, I was especially interested to see another copy outside the museum. 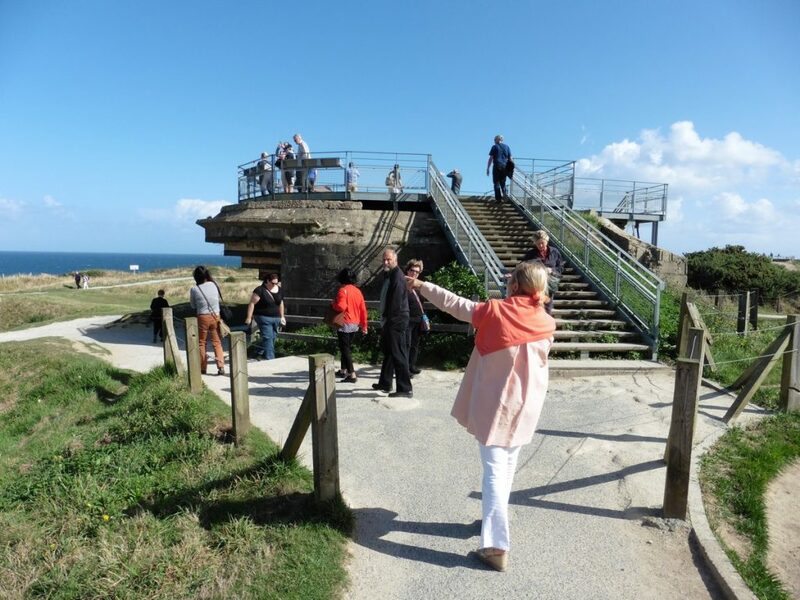 The highest point between American D-Day landing points Omaha Beach and Utah Beach, Pointe du Hoc was fortified with German concrete casemates and gun pits. 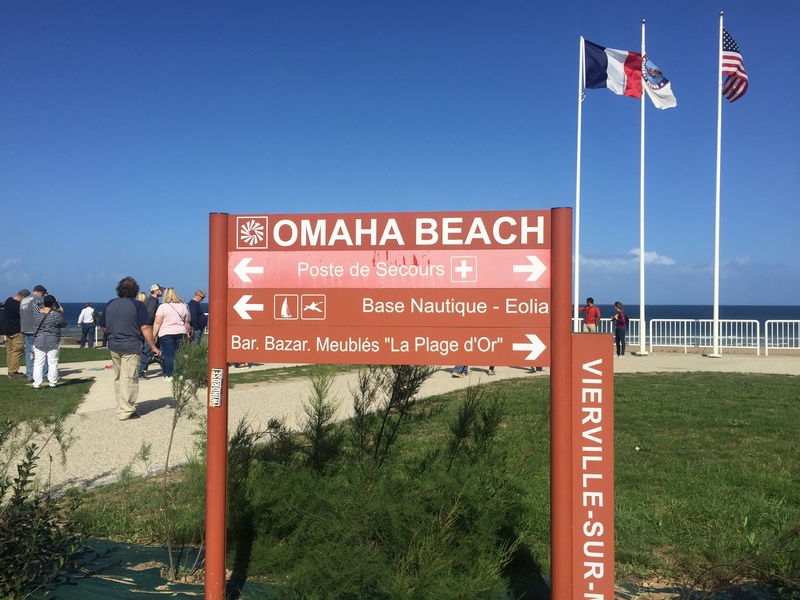 The monument here was erected by the French to honor members of the American Second Ranger Battalion who scaled the 100-foot cliffs and seized the German artillery pieces that could have fired on Americans landing on Omaha and Utah Beach. 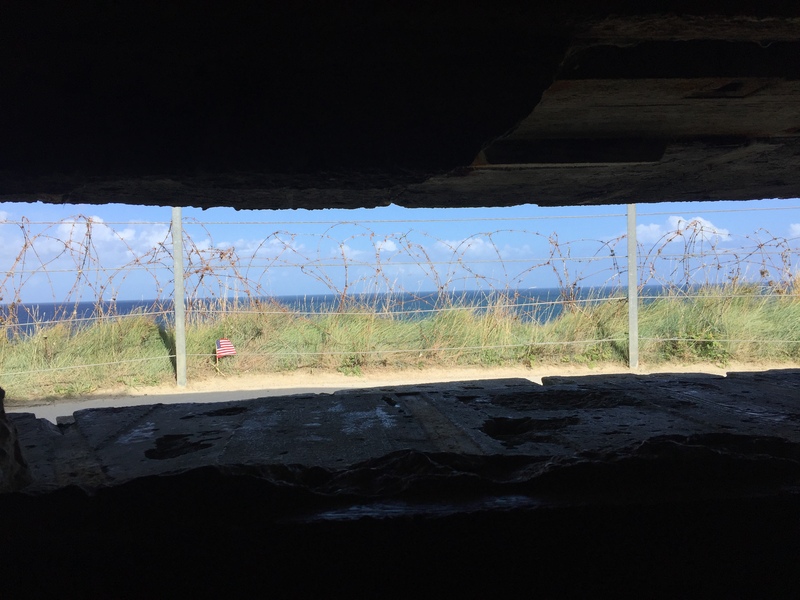 We went in the gun pits and got the same view the Germans did. and craters made by the bombs. 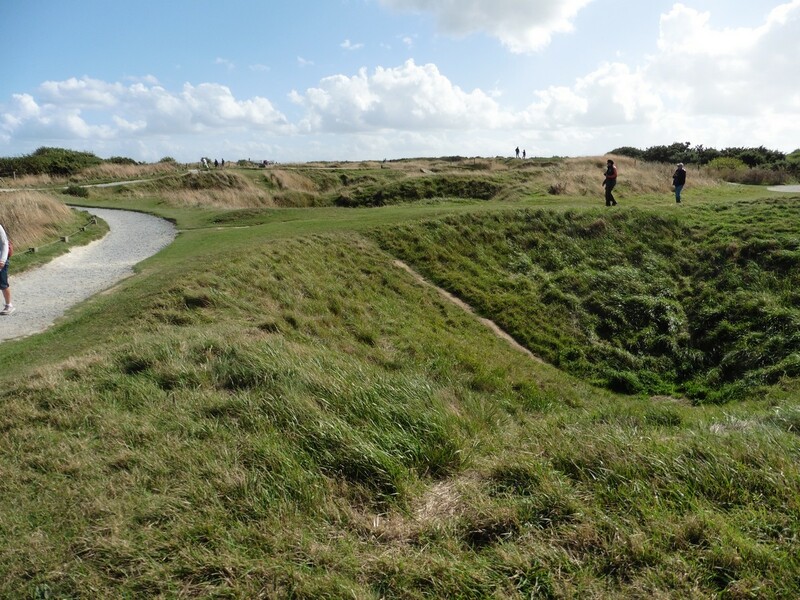 It was sobering to look out over Omaha Beach, where more than 2,000 soldiers died in the initial attack. 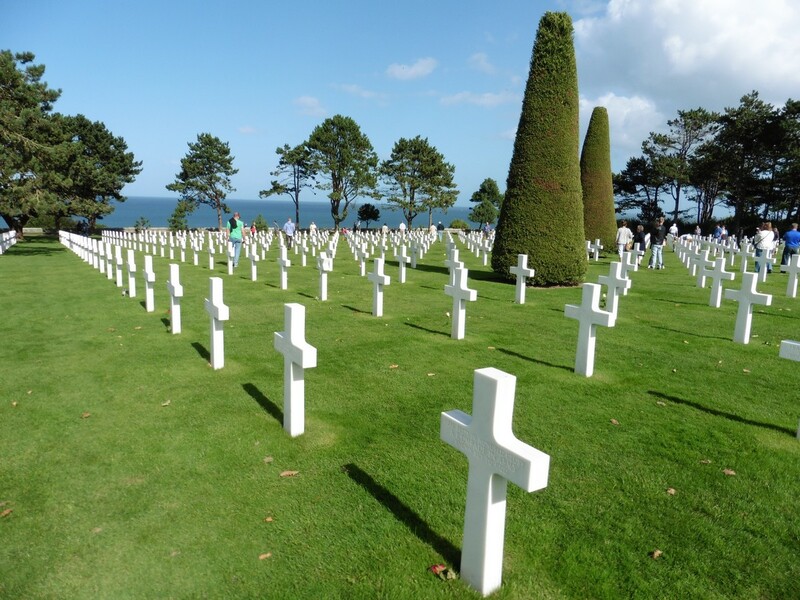 As we walked down the central mall and saw the 9,387 headstones of American soldiers who died in the Normandy battles to liberate France and drive into Nazi Germany, we felt overwhelming sadness at the loss of life. From some views, it seemed that the headstones went on forever. A single rose lay at the base of many of the headstones. I wondered who had put them there and felt warmed by the thought of people remembering these soldiers. The Garden of the Missing is outlined with polyantha roses. 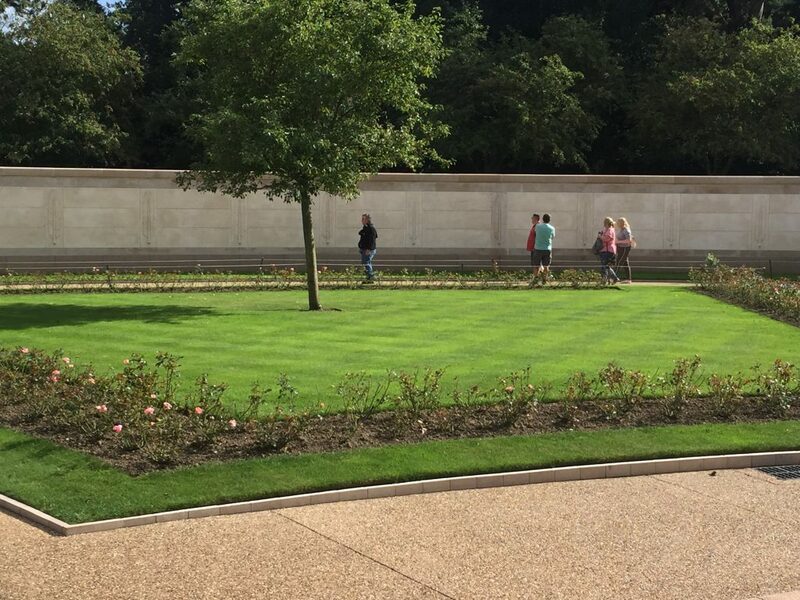 Names of the missing are engraved on granite walls surrounding the garden. Bronze rosettes mark the names of soldiers whose remains were found and identified later. At the center of The Memorial the statue “The Spirit of American Youth Rising from the Waves” faces west toward the headstones. 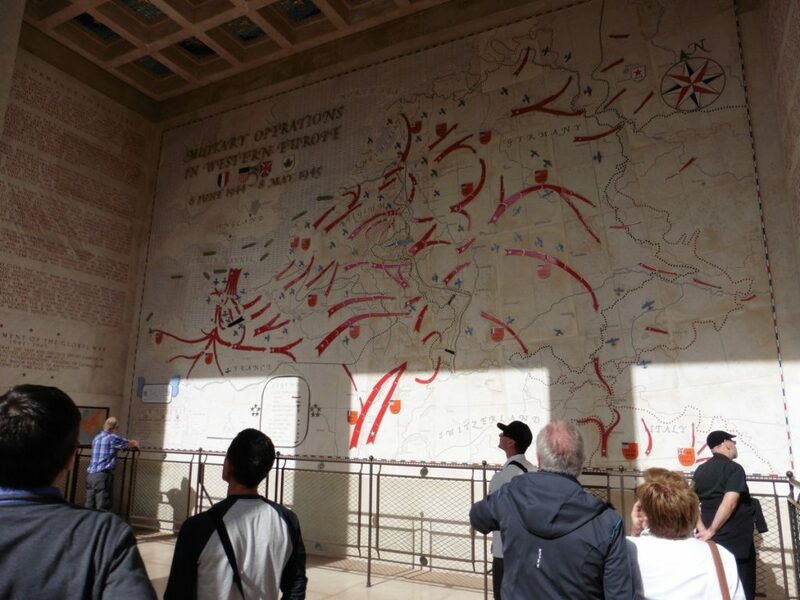 An impressive granite illustration on one wall of The Memorial shows the movement of the troops and the progress of the assault. It was a very emotional day, but we appreciate the opportunity to experience the power of these places and be reminded of the sacrifices made by so many. This entry was posted in Amsterdam, Bruges, Paris 2016 on September 26, 2016 by debbie.